Going to the movie theater is a cherished American tradition. New York has no shortage of interesting venues for this purpose, with movie theaters in everything from historic structures to hip bar/restaurants. Here is a list of the 10 coolest movie theaters in New York State. This Brooklyn movie theater is also a full-service restaurant and bar. Moviegoers are treated to a delicious menu, with food and drinks delivered right to their chairs during the film. Built in 1948, this single-screen indie cinema is one of the oldest and most unique movie theaters in the state. The interior is a Quonset-hut design with an Art Deco influence. Refurbished in the 1990s, the theater now seats 380 people and has many of the original furnishings, like the waterfall curtains. Viewers can eat and drink their way through showings at Alamo Drafthouse Cinema in Brooklyn. 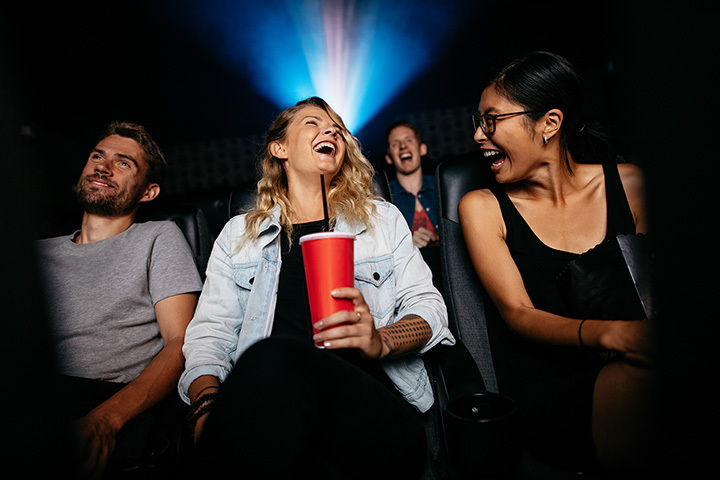 Patrons order from their seat by writing their menu item down on paper, and meals are delivered during the movie by swift, discreet wait staff. For those who want “new movies in a classic setting,” Vintage Drive-In is just the venue. The drive-in movie theater has four screens that remind moviegoers of eras past, but play new films. The grounds also host a flea market every Sunday. Hailed as “Buffalo’s finest neighborhood theater,” North Park theater has been screening films since 1920. The single-screen theater was taken over independent management in 2013, has an old-fashioned move theater exterior, and showcases ornate murals in the lobby. This Brooklyn theater-bar-kitchen does it all. The restaurant crafts high-quality meals and drinks for guests, and there is a 50-seat theater that shows two to three “expertly-curated films” a night. Ask to see the “hands-free” theater menu for movie-front dining. Moviegoers at Amherst Theater snuggle up in plush new recliners to view one of the hand-picked, high-quality films on offer. The historic Buffalo theater originally housed just one movie, but now offers a selection of three as well as tasty concessions. Opened in 1926, this Adirondacks movie theater reminds the watcher of a bygone era. Now fully restored, the grand movie theater is reasonable priced and airs films on four different screens. This East Village art house theater is a favorite of Manhattanites looking for a unique movie theater. Originally opened in 1898 as a theater, Sunshine Cinemas had been shuttered and operating as a hardware store until Landmark Theaters restored it to its former glory in 2001. Rooftop Cinema Club teams up with two New York City buildings in Manhattan and Bushwick to offer a unique rooftop movie experience in the summer. Moviegoers sit in lawn chairs and use a pair of headphones to block out the city noise. Food and alcoholic beverages may be served. View more New York Movie Theaters.